There’s nothing quite like drinking a cup of hot coffee on a crisp autumn day. 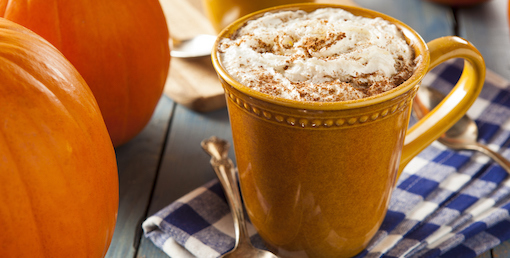 Our favorite go-to drink to indulge in during the fall is the beloved, aromatic pumpkin spice latte. Instead of spending a few dollars every day on a PSL at your favorite coffee shop, use these homemade alternatives to spice up your cup of coffee this season. Fall is nothing without a little (or a lot of) pumpkin spice. The fragrant, spiced flavor reminds us of cool fall days, the beautiful changing leaves on the trees and our favorite Pure Michigan things to do in the fall. Our Green Mountain Coffee Pumpkin Spice K-Cups are the perfect way to turn an ordinary day into an extraordinary fall day. Enjoy the cup of coffee brewed as usual, use it as a base for the perfect pumpkin spice latte, or spice it up with some of the below recipes for the best autumnal cup of coffee. Our pumpkin spice K-Cups are only available for a limited time, so you’ll want to get them while they’re hot. Learn how you can have them shipped straight to your doorstep here. Adding pumpkin pie spice mix to coffee grounds before brewing a pot of coffee is a great way to incorporate a subtle taste of pumpkin and fall into rich, aromatic coffee. Sure, you could buy pumpkin pie spice at the store, but the homemade version tastes so much better. Simply mix 1/3 cup cinnamon, 1 tablespoon each of nutmeg and ginger, and 1 ½ teaspoons each of cloves and all spice together. Yes, it really is that easy! Once combined, spoon a few teaspoons into your coffee grounds and brew an you normally would. Store the leftover spice mix in an airtight container for maximum freshness. In the unfortunate event you don’t have any Pumpkin Spice K-Cups on hand, topping off your regular coffee with pumpkin spice coffee creamer is a great alternative. Coffee creamer is surprisingly easy to make, and homemade creamer means you control the amount of sugar and sweetness added to the mixture. Plus, homemade pumpkin spice coffee creamer is made with real pumpkin puree, rather than the artificial flavorings in storebought creamers. If you prefer nondairy creamers, try this recipe with soy, almond or coconut milk. Yum! A warm beverage isn’t complete without a heaping dollop of whipped cream, so why not top it off with a little pumpkin spice whipped cream? This recipe requires five ingredients (yes, pumpkin pie spice is one of them) and five minutes of your time. Once you have a bowl of fresh whipped cream, perfectly pair it with coffee, flavored lattes, hot chocolate and more. If you’re craving pumpkin spice coffee, look no further than Absopure’s home delivery service. Give us a call at (800) 499-9938 to learn more, or click here to learn more about our coffee offerings.